The amount of money being invested in private companies has never been higher. It even beat the $105 billion invested in 2000. Of course, that was during the revolutionary tech boom of the ‘90s and early 2000s, which has completely transformed the world. And I don’t believe this next stage of innovation will be any different. Naturally, whenever the year 2000, which is associated with the dot-com bubble, is brought up, there’s some skepticism that companies are overvalued and investments are too high. That was true during the bubble, as we saw with Yahoo being valued at $76 billion with less than $600 million of revenue in 1999. However, venture capitalists have learned from these mistakes. And we’re not seeing outrageous valuations like that today. The companies that are able to make these big investments are called venture capitalists. And when they make an investment, it falls into three main categories depending on the size and progress of the business. The earliest type of investment is called “angel” or “seed” investing. This is when a venture capitalist puts their money into a company that is just starting out. It’s the riskiest stage, of course, but it also has the highest potential payoff if that company becomes successful. The next stage is called early venture capital (VC). This type of funding is given when a company has begun operations, but needs money in order to market and sell their products or services on a commercial scale. And then the last stage is called late VC. This is when a company has established itself, has steady sales but not necessarily profits and wants to expand. Late VC can be done when the venture capitalist firm is looking for a profitable long-term stake in the company. Or it could be done to prepare a private company for an initial public offering (IPO). Below is a chart that shows how these types of funding have been growing over the past 10 years. This chart puts into perspective just how much these private companies are growing. That is, there’s more growth in money flowing through late-VC transactions than the other stages. That means these companies have “made it” in their industry, have steady sales and are beginning to enter a phase of expansion, possibly going public in the process. 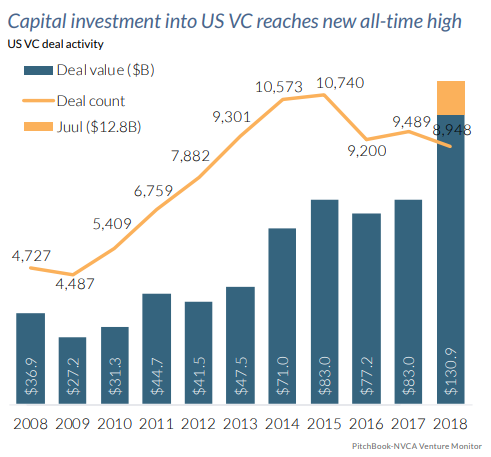 That growth in late-VC investment helped push overall VC activity to record highs in 2018. Overall, the total value of deals grew by 58% compared to 2017. And even if you take out the huge Juul investment, which could be seen as an outlier, overall funding was still 42% higher in 2018. There’s also the fact that the most valuable private companies have been going public at a relatively high rate over the past two years. 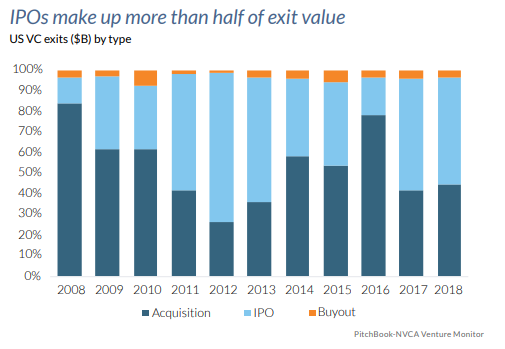 Only about 15% of companies chose the IPO method as their “exit” method in 2018, as opposed to being sold to another company. However, the amount of money that these companies brought in through IPOs made up about 50% of the total exit value in 2018. This means that we’re mainly seeing the most valuable private companies come public. And that makes for great investment opportunities, as it’s much easier to buy a part of a public company than a private one. Of course, these venture capitalist companies are particular about what they invest in. Some routinely go through hundreds of funding applications without accepting a single one. So, the fact that we’re seeing so much activity right now is extremely promising for the economy. These private businesses will shape how we live through up-and-coming industries such as robotics and blockchain. They’re also reshaping everyday things that we already do, like travel (Uber, Lyft, Airbnb) and shopping/delivery (Postmates, Boxed, DoorDash). Thankfully, even though these companies are not publicly traded, there’s a way to invest in the broader VC industry. The Invesco Global Listed Private Equity ETF (NYSE: PSP) invests in the stocks of 61 different VC firms. This exchange-traded fund (ETF) is the best way to invest in these companies while they’re still private. And then, as they become public, you can get a head start in investing in them by buying the Renaissance IPO ETF (NYSE: IPO), which I recommended last week. Both of these provide great ways of reaping the benefits of future technology before the crowd gets in.